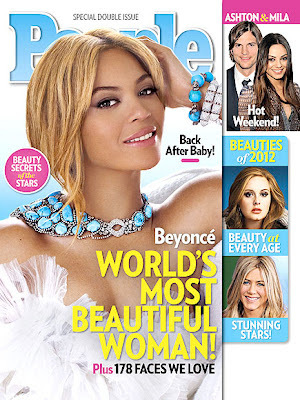 New mom Beyonce has yet another honor to celebrate -- the singing superstar has been named the World's Most Beautiful Woman 2012 by People. "I feel more beautiful than I've ever felt because I've given birth," the 30-year-old, who welcomed daughter Blue Ivy with husband Jay-Z in January, told the mag. "I have never felt so connected, never felt like I had such a purpose on this earth."